Ok so the PS90 has been on my “want” list forever. The 5.7 round is interesting and odd, which I like. This is not a discussion on merits or not of 5.7, please. But...despite being close to finally picking up a PS90, I learn about the CMMG Banshee in 5.7 that just came out. Easily suppressed, 4.7 lbs, AR platform. Both about the same price. The PS90 trigger is what is (poor). But the 16 or 10 inch barrels will carry more velocity than the 5 inch on the banshee. Banshee easily supressed. Curious on folks thoughts about CMMG, I am wanting to get in 5.7 game an AR platform makes a lot of sense. 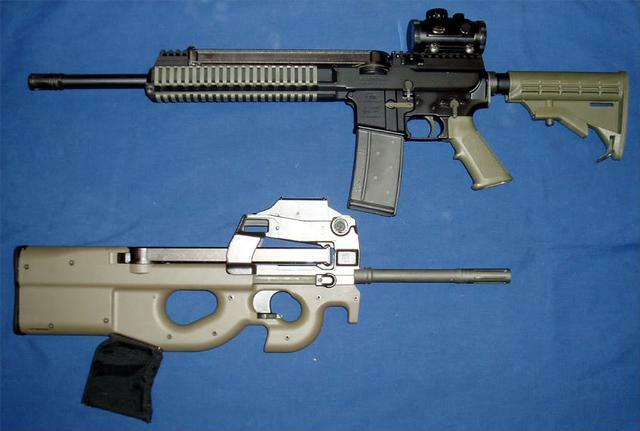 They are functionally same cost, except I need to pay $200 tax stamp on PS90 for SBR and can get CMMG as a pistol. New to 5.7. Purpose is plinking fun, home quick access weapon (5.7 SS198 will be stopped by walls but go through body armor), and truck gun. So thoughts on this - CMMG? AR vs PS90 platform in 5.7? I have had a PS90 for 5 years it is a great shooting gun. ammo can be pricey at times but I love my gun. Just bought an Acog and low mount to try out. I think CMMG has an 8” version also. That might get you in to some better ballistics than the other pistol lengths. I’d like to see some terminal comparisons to a 7.5-8” AR. I just priced the Banshees! It'd be cheaper for me to get a PS90 and SBR it and be able to use the 50 round mags. I was really hoping there was a cheaper alternative. I could never get my department to approve the round. I think the overall benefit of the round would be best served in the PS90. The carbine is light,easy to shoulder,actually has a comfortable grip and more compact compared to an ar version,in my opinion. I had one years ago but sold it and I kick myself for doing so. It is a fun gun to shoot as recoil is light and it is accurate. If you sbr it, it really makes a fun gun. They are getting pretty pricey though. It uses the same 50 round mag and a modified mag to catch the brass. The above is an old picture, I had them both but have sold the PS90 ... and have since cut the AR57 barrel down to 8"
This has nothing to do with your exact question. I don't own the CMMG and I have never seen one. I'm guessing no one has at this point. But I do have lots of 5.7 experience. I own the AR57 and a number of PS90's. Given a choice I'd take a PS90 all day long. In the scheme of things a PS90 is likely to be a long lived gun. The others I don't know. I have fired enough 5.7 rounds to have complete confidence in the PS90. It has issues, trigger and height over bore to name two. AT the price of ammo I'd never suggest you get into 5.7 at this point. But if you do get a PS90. Thanks all. I have been buying 5.7 ammo on sale off and on for a few years just in case I jumped in. Yeah, I know collecting ammo before the gun...only caliber I have done this. I like the CMMG the more I learn, but for now think I’ve landed on the PS90. Always wanted it and with SBR it still has a 10” barrel. Now to find the PS90.. While the price ice is high, others may join in with adapters and uppers. I wouldn’t mind an 8-10” pdw type, it not at that price. With all due respect to Kimberkid who has the opposite opinion of mine, I personally can't get around the idea of using the AR Platform to shoot far more expensive, rarer and less powerful ammo. I find the PS90 an interesting and fun gun in it's own right and have a couple of them. No they don't have a trigger as good as most any AR but thats not the point. To me they are just a very interesting weapons platform. Yes AR's are more accurate etc etc but why downgrade their capability? If you wan t a 5.7 pistol buy the FN 5.7 pistol. If you want an AR 223 and 300 Blackout are far better calibers. If you're going to do it, do it in an SBR'd PS90. 1) I'm in the Army and have standardized my collection around either the AR platform, or something that uses the same manual of arms (MPX). 2) I have an MPX pistol that fulfills the role of a P90 to my specifications, in a much less expensive caliber (and unlike the PS90 I can keep loaded mags for the MPX "pistol" [read: faux submachine gun] in the car). 4) I doubt the ammo's getting any cheaper, nor do I expect magazines to become any more available. And yet I'm still going to do it, because dad's is JUST THAT MUCH FUN. It's like a Coonan. Its weirdness is a selling point to me, especially since it's weird in SUCH A GOOD WAY. Every time I pick up a P90, I go straight Fox Mulder and I WANT TO BELIEVE the hype about the round, because everything else about shooting that little bullet hose is just so great. I can even forgive the trigger, which really isn't all that worse than a GI AR trigger, because it's designed as a close in personal defense weapon, not a competition rifle. The cordless-drill swivel safety makes me giggle every time. I may or may not start quoting Jack O'Neill and/or Daniel Jackson while I play with it...your mileage may vary. If I were you, I'd follow your first instinct and do the 5.7 as it was always intended to be done: out of that goofy Belgian space gun. Nobody's gonna know what a 5.7 AR is in a few years except people who like both. If they still let kids play violent video games in fifty years, your grandkids will know what a P90 is and think it's just cooler than hell that you own one. I wasn't familiar w the P90 SMG. Don’t know much about the Banshee, but I really like the PS90. It’s extremely light, easy to maneuver, and the mag holds 50 rounds. The trigger is not bad, and they do make aftermarket kits to improve the trigger. Guess it depends on your preferences. 5.7 is a cartridge that should make you consider becoming a hand loader. Once you have the brass, reloading it is a fraction of factory ammo. Powder and primer would be $.05 per round, with a bullet somewhere in the $.15 range, for a total of 20 to 25 cents per round, depending mostly on what bullet you choose and if you buy in bulk. This is about 40% of the cost of new 5.7x28. Some cartridges don’t give so much in savings for the reloader, like 9mm. 5.7 is one with a large payback. You can make over a thousand rounds with a single pound of powder. Frankly I don't get why the Banshee is so out-in-the-stratosphere spendy. I looked into one of their braced 9mm pistols for a customer and told the customer to just buy a PSA AR-9 pistol and take the $900 he'd save and buy something else cool...like 4 1/2 cases of ammo to feed his new AR-9. Maybe CMMG figures that SIG's pricing for the MPX these days and those of the various MP5 clones leaves a ton of market space for themselves. But considering that generally unreliable 7.62R Mutant that they also are fond of stinging buyers with at the cash register, CMMG seems to think awfully high of themselves, whether it's deserved or not. If 5.7x28 is your future poison, I'd say do it up with the Real Deal originals and leave the pretenders to mire in the muck. FNH knows their creation; everyone else is still trying to figure it out. After a couple years I sold my PS90 as it just didn't do anything for me and sat in the safe ... then bought an AR57 just to shoot up the ammo but it was kinda "Meh" too. Then I found a full auto bolt and put it on my M16 ... now its giggle worthy! I have been reloading that round for half a dozen years on the 550.Bullets were a pain to come by years back and the recommended powder. I lucked out on brass as a member gave me a gallon of it from a dealer shoot. I have loaded up hundreds of rounds. Not my favorite ,right up there with 380. Fat fingers are a curse. Saw that the price had come down a bit on some new “old” stock. Cleared with the boss, as long as I got the color she wanted she was ok. So picked it up today, this is small, light and very nice. Range report to come, going to put a Romeo5 I had on it for now and take it to the range next week unless I can free up time this weekend. What decided it for me was the familiar AR platform and use of the FN mags once I get a Five Seven at some point. Aww hell who needs reasons, it is a cool gun . Also have a few extra AR Geisel Triggers to swap in. Will put either a Sparrow or Dead Air Mask on it, good excuse to pull the trigger on the .22 suppressor I have been considering. Pics to come but here is a stock photo...white is growing on me. I love the color. 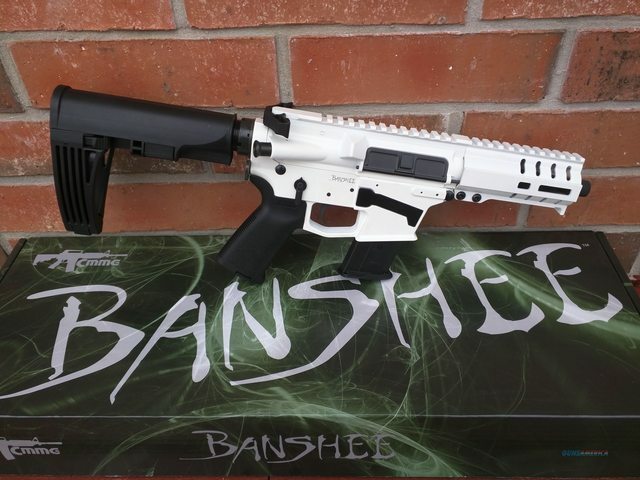 I have a banshee in 9mm. But the thing is frankly too short in the forend if you don't have a suppressor on it. Will be interesting to see what you think in 5.7. As noted above I'm a ps90 fan but not so much a fan of the round in a pistol. SS198 from that barrel length won't do what you suggest above (but of course I'm not starting an ammo discussion, just reporting the facts).